This all-inclusive resort is a wonderful haven for aquatic sports lovers. 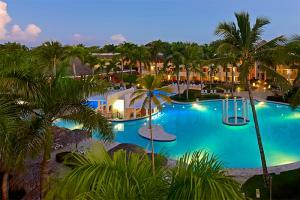 Renovated in 2011, the Iberostar Costa Dorada hotel has 498 Double Rooms and 18 spacious Junior Suites. The colonial-style complex and common areas are surrounded by huge tropical gardens. The Iberostar Costa Dorada hotel is located in front of the large golden sand beach of Costa Dorada.